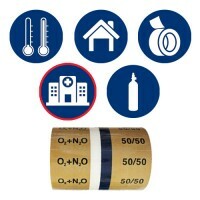 Hospital / Medical Gases Pipe ID Tape- Campbell International Specialist Tapes. Campbell International medical tapes are used to identify the contents of pipework in hospitals, medical and research facilities. All our tapes conform to British Standards and are available for next day dispatch, we can also supply any custom printed tapes or extend our range if we do not currently stock what you require. In addition to the tapes listed below, we also supply the following tapes: M.A.4, A.G.S.S, Exhaust, H2(OF), N2O, S.M.G, He and H2. Size: 144mm x 33m	Colour: Black/Yellow Ochre/Grey Band	Technical specifications: White rigid PVC coated one side with a transparent resin rubber adhesive laminated with a 30 micron transparent polypropylene for environmental protection. Recommended for internal use only.British Standard: BS 1710:20.. Size: 144mm x 33m Technical specification: 144mm laminated pipeline identification tape perforated every 62mm into labels. White rigid PVC coated one side with a transparent resin rubber adhesive laminated with a 30 micron transparent polypropylene for environmental protection. Recommended for .. Size: 144mm x 33m	Colour: Black on yellow orche, blue and white band	Technical specifications: White rigid PVC coated one side with a transparent resin rubber adhesive laminated with a 30 micron transparent polypropylene for environmental protection. Recommended for internal use only.British Standa.. Size: 144mm x 33m	Colour: Black/Yellow Ochre	Technical Specification: White rigid PVC coated one side with a transparent resin rubber adhesive laminated with a 30 micron transparent polypropylene for environmental protection. Recommended for internal use only. British Standards: BS 1710:1984, BS 1.. Size: 144mm x 33m	Colour: Black on blue with canary yellow/primrose centre band	Technical specification: White rigid PVC coated one side with a transparent resin rubber adhesive laminated with a 30 micron transparent polypropylene for environmental protection. Recommended for internal use only.Brit.. Size: 144mm x 33m	Technical specification: 144mm laminated pipeline identification tape perforated into labels. White rigid PVC coated one side with a transparent resin rubber adhesive laminated with a 30 micron transparent polypropylene for environmental protection. Recommended for internal use on.. Size: 144mm x 33m	Technical specification: White rigid PVC coated one side with a transparent resin rubber adhesive laminated with a 30 micron transparent polypropylene for environmental protection. Recommended for internal use only.British Standard: BS 1710:2014	Please note we also supply M.A.4 an.. Size: 144mm x 33m	Technical specification: White rigid PVC coated one side with a transparent resin rubber adhesive laminated with a 30 micron transparent polypropylene for environmental protection. Recommended for internal use only.British Standard: BS 1710:2014 .. Size: 144mm x 33m Perforated every 62.4mm	Technical specification: White rigid PVC coated one side with a transparent resin rubber adhesive laminated with a 30 micron transparent polypropylene for environmental protection. Recommended for internal use only.British Standard: BS 1710:1984 .. Size: 144mm x 33m	Technical specification: White rigid PVC coated one side with a transparent resin rubber adhesive laminated with a 30 micron transparent polypropylene for environmental protection. Recommended for internal use only.British Standard: BS 1710:1984 .. Size: 144mm x 33m	Colour: Black on yellow ochre, white band	Technical specification: White rigid PVC coated one side with a transparent resin rubber adhesive laminated with a 30 micron transparent polypropylene for environmental protection. Recommended for internal use only.British Standard: BS 171.. Size: 96mm x 33m	Colour: Black on Clear with crimson 04D45 band. Technical specification: White rigid PVC coated one side with a transparent resin rubber adhesive laminated with a 30 micron transparent polypropylene for environmental protection. Recommended for internal use only.British Standard: B.. Size: 144mm x 33m perforated every 62.4mmColour: Black text on Yellow Ochre Technical Specification: White rigid PVC coated one side with a transparent resin rubber adhesive laminated with a 30 micron transparent polypropylene for environmental protection. Recommended for internal use only.British S..